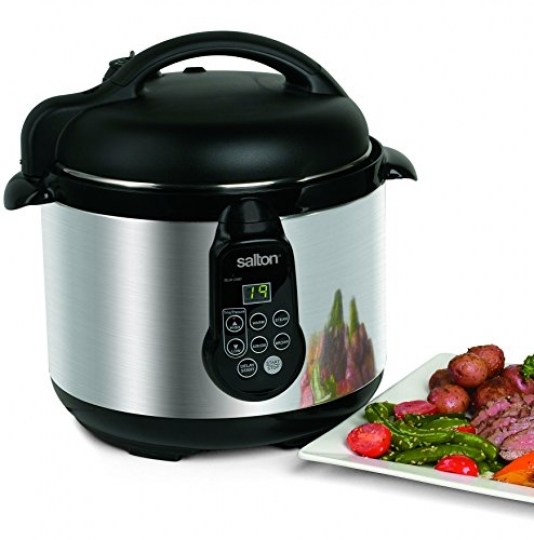 The Salton 5 liter electronic pressure cooker 1 of 7 safety devices for worry free use. 5 function control: warm – reheats or keeps cooked food warm. Brown – browns meat before pressure cooking. Slow cook – cooks slowly up to 9.5 Hours. Steam – quickly brings liquid to a boil for steaming or cooking rice. Delay start – programmable timer delays cooking up to 8 hours. Tenderizes less expensive cuts of meat. Preserves flavors and nutrients. Pressure release valve allows you to release pressure quickly. Features non-stick coated cooking bowl and cool touch exterior.